Jose Mourinho highlighted Manchester United's lack of "killer instinct" in front of goal and the low number of clean sheets this season as areas of concern. United drew a line under their Champions League defeat to Juventus in midweek as goals from Paul Pogba and Anthony Martial secured a 2-1 win against Everton at Old Trafford. However, it was a far from convincing display from the hosts, who have kept just one opponent scoreless this season after gifting the Toffees a lifeline when Gylfi Sigurdsson scored from the penalty spot. At the other end of the pitch Marcus Rashford proved just as ineffectual up front as Romelu Lukaku, who was benched for the visit of his former club and took his United drought to nine games after coming on as a substitute. "We are playing OK, we are not as rock solid as I would like," the Manchester United manager said. "We don't have the killer instinct that I would like. Some teams with three chances they score three goals and some teams without the ball can resist and keep clean sheets all the time. "For us it is almost an impossible mission to keep a clean sheet even with the phenomenal goalkeeper we have and to score goals is really difficult for us." 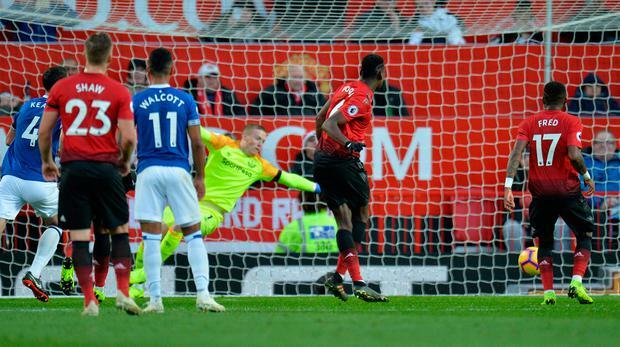 Pogba broke the deadlock after 27 minutes but only after converting the rebound when his penalty was magnificently saved one-handed by Everton goalkeeper Jordan Pickford. His stuttering run-up, in which he took marginal steps forward without ever really accelerating towards the ball, attracted criticism on social media. Mourinho admitted Pogba should perhaps think about altering his technique but commended the World Cup winner for his willingness to front up. Mourinho said: "The thing I like is the desire to take it. "I don't like Mickey Mouses: fragile, afraid to go, I don't take penalties. I don't like that, I like the player that I want to take it. "Paul wants to take and that for me is fantastic. If he misses, he misses. "Can he improve his penalty? I think he can, I think the goalkeepers don't move and they are waiting for his decision so I think he probably has to learn from that. "But for me the most important thing is next time we have a penalty he wants to go again." Pogba was given the opportunity to put United ahead after Martial went down under a challenge from Idrissa Gueye, who appeared to get a slight touch on the ball before barging into the Frenchman. Everton manager Marco Silva lamented the flashpoint as a turning point in the game and believes his side did not deserve to walk away empty-handed. "We didn't deserve the result, for me it's clear," he said "When you play here and create the chances we created. "We came here to try to do everything to try to win the match, not come here to see and just to block them. "We played well in some moments of the game. Until the penalty the game was a balanced game. "The bad decision - I know the referee can make mistakes like I make, but in that moment it's clear. No penalty. It's not a penalty and that made them more comfortable. "Of course we are unhappy with the result but one penalty and one fantastic finish made the difference." Independent.ie Newsdesk It is far from ideal conditions in Manchester this evening as wind, rain, thunder and lightning hit Old Trafford ahead of the crucial Premier League derby clash.